Next Level Strength and Conditioning is now offering Private Team Training packages for all sports, ages and experience levels! Our team of highly qualified Strength Coaches will design a comprehensive training program that is tailored to meet the specific needs of your athletes based on their sport, age, experience, skill level and training goals! Gain an edge on your competition and reduce the risk of injury, while building valuable team comradery! Team Training sessions can be held at Next Level OR at your home practice facility/ school! 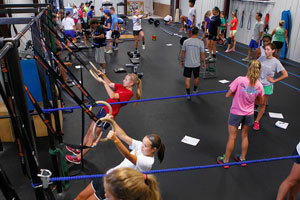 Team Packages can be as low as $5/ athlete/ session (based on number of sessions/ athletes)! Email us TODAY to schedule your FREE Team Training demo session for up to 30 athletes! A comprehensive Sports Performance program will be designed to meet the specific needs of your team or group, based on your sport, age, performance goals, etc.